For the first ten years of its existence, the Rolex Sea-Dweller was manufactured with both the “Sea-Dweller” and “Submariner 2000” names printed in red text on the surface of the dial. 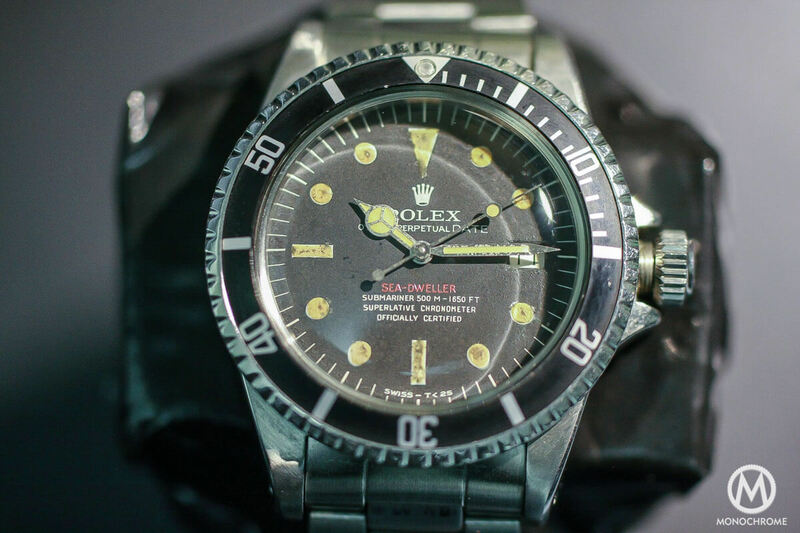 However in 1977, Rolex released a new Sea-Dweller – still under the 1665-reference number, that abandoned the red lines of text, along with the Submariner name, in favor of an entirely black and white dial. The Great White is a Sea-Dweller Ref. 1665, made to go 2000ft under water. Due to the monochromatic text of the dial of the new reference 1665 Sea-Dweller, the watch earned the nickname the “Great White” among Rolex collectors, as a means to help distinguish it from the earlier reference 1665 Sea-Dweller watches that featured red text on the surface of their dials. Additionally, this change to an entirely black and white dial for the Sea-Dweller would be a lasting decision that would stand for forty years, until the release of the reference 126600 Sea-Dweller at Baselworld 2017. 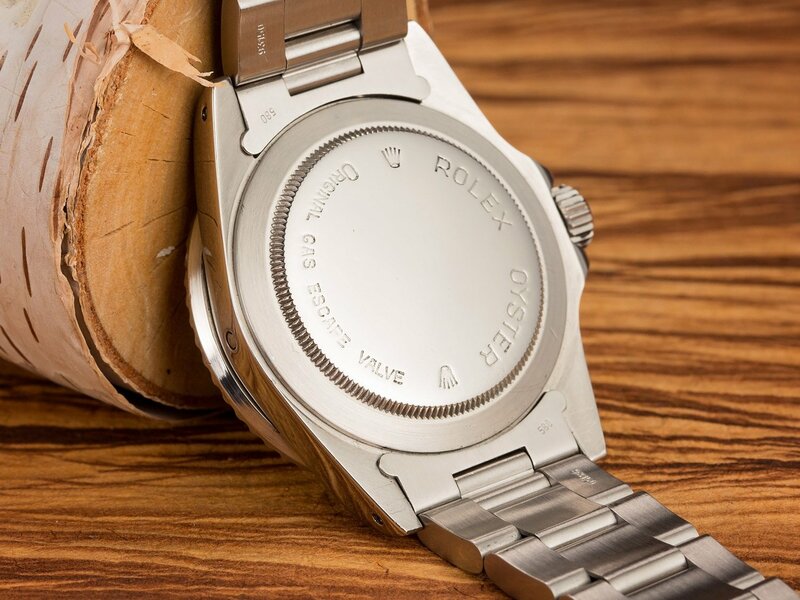 The caseback of the watch reads “Rolex Oyster” and “Original Gas Escape Valve”. To accompany the updated dial of the “Great White” Sea-Dweller, the case-backs on the new generation of reference 1665 watches received slightly more refined engravings, in which the Rolex name curves along the arc of the fluting, rather than appearing in a straight line. 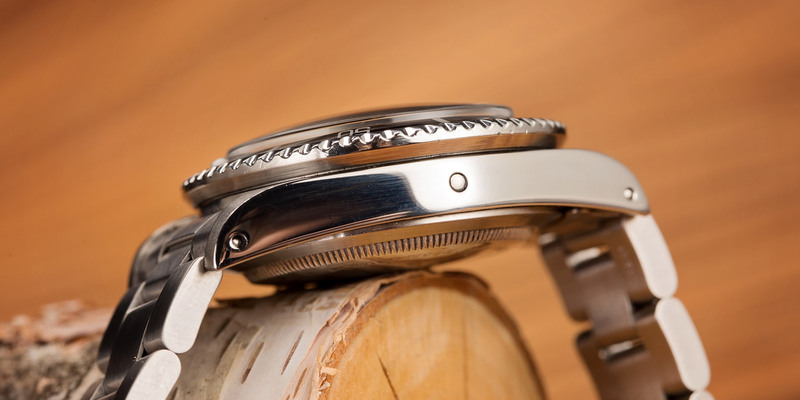 Beyond the subtle updates to the dial and case-back, the new generation of reference 1665 watches was very much like the previous ones that had featured red text; however what the updates on the “Great White” represented was far more important than the actual changes to the watch themselves. The Sea-Dweller was made from a Submariner. The Sea-Dweller began its life as a Submariner that had been modified to be even more water resistant in order to withstand even greater depths below the surface of the ocean. For the first 10 years of its existence, the dial of the Sea-Dweller also had the Submariner name printed on it, so it was somewhat unclear as to whether the Sea-Dweller was a separate line of watches, or merely a special version of the Submariner that had been designed for more rigorous professional use. On the Double Red Sea-Dweller, the dial had both “Submariner” and “Sea-Dweller” causing confusion. 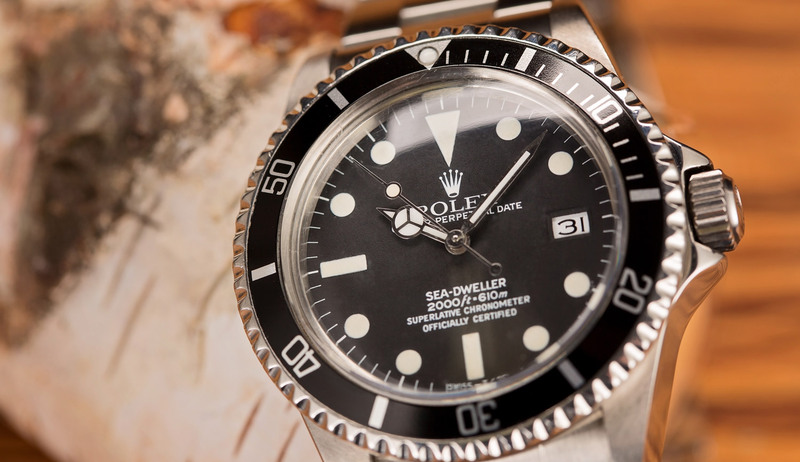 Although the elimination of red lettering made for a rather noticeable visual change, the removal of the Submariner name was the most important change that accompanied the arrival of the “Great White” reference 1665. 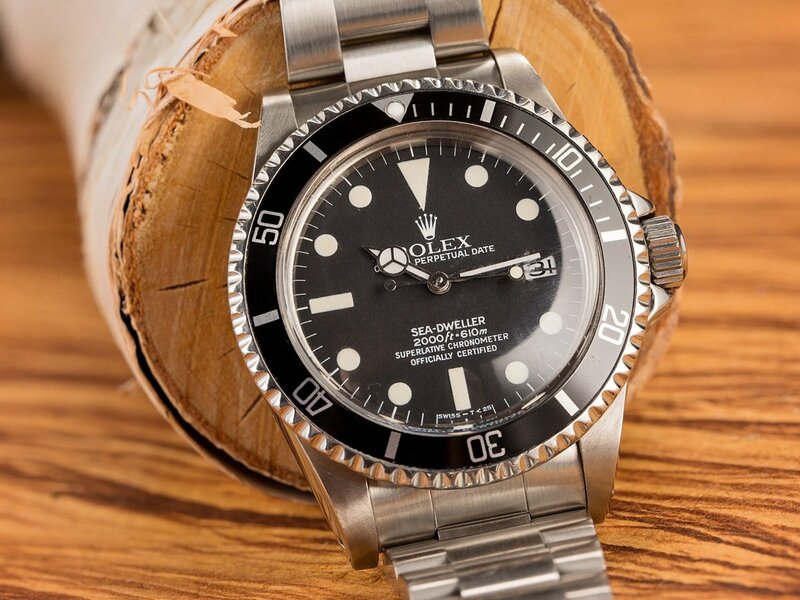 Without the Submariner name appearing on the dial, it was an obvious signal to the public that Rolex intended the Sea-Dweller to be its own line of watches, separate from the Submariner, and filling a slightly different niche within their lineup of highly competent, professional watches. The escape valve was a critical upgrade on the Sea-Dwellers as they prevented damage from pressure. The reference 1665 “Great White” Sea-Dweller remained in production for roughly five years, during which time a number of small changes took place, and five different dial variations (known as Mark 0 through Mark IV) were manufactured. 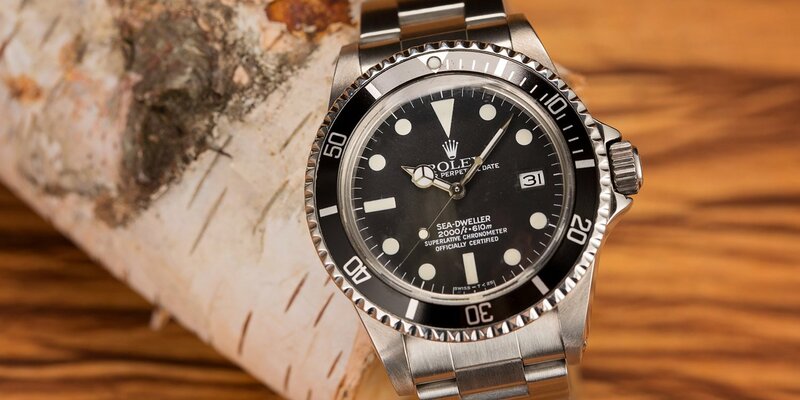 Additionally, production of the “Great White” reference 1665 lasted into the early 1980s – several years after Rolex had announced the new reference 16660 Sea-Dweller with sapphire crystal in 1978. Unusually, both Sea-Dweller references appear to have been available alongside each other for a few years. Although it is not the rarest iteration of the Sea-Dweller that Rolex has ever produced, the reference 1665 “Great White” is the watch that helped distinguish the Sea-Dweller as its own unique line of highly specialized, ultra-water resistant, tool watches – separate from the Submariner and specifically engineered for the rigors of saturation diving and professional use.